His witty interpretations of human life can even make the toughest art critic smile. Charles Bragg's work is whimsical and light hearted. His entourage of characters play out situations from everything from the justice system to professional ballet. 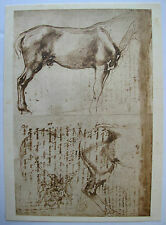 MICHELANGELO 1970 Lithograph "STUDIES OF HORSES"
It is as painstakingly close to the priceless originals as possible. The original is on display within the Ashmolean Museum in Oxford. This lithograph was reproduced in a very sophisticated process by a well-respected and renowned lithographer, Mr. Amilcare Pizzi. Nu Assis a la chemise 1916-1917. Musee du Luxembourg. Published for the Musee du Luxembourg for an Exhibition in March 1980. Image Size: 14" x 19". New, Unused. The print on paper is a limited edition (#5 of 10) and is in very good condition. Ms. Sunderwirth was born in 1931 and has exhibited widely throughout the Denver area. Size: Live (image) area 20 1/2" x 18" (to bottom of signature). MICHELANGELO 1970 Lithograph "STUDY FOR AN ANNUNCIATION"
It is as painstakingly close to the priceless originals as possible. The original is on display within the British Museum in London. This lithograph was reproduced in a very sophisticated process by a well-respected and renowned lithographer, Mr. Amilcare Pizzi. This is a limited edition hand signed lithograph by Nigel Hemming titled "Generations Yellow Labradors ". Nigel Hemming is undoubtedly one of the country's most successful animal artists. Nigel Hemming works have been published in limited edition form since the mid 1980's, enjoying increasing popularity with each new edition. MICHELANGELO 1970 Lithograph "NAKED FOR THE BATTLE OF CASCINA"
It is as painstakingly close to the priceless originals as possible. The original is on display within the Casa Buonarroti Museum in Florence, Italy. Elke started to paint in earnest using anything at hand for a canvas. This piece is numbered from an edition of 350. 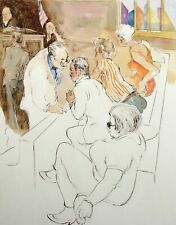 Art print Charles Bragg artistic Signed Color Lithograph MIGHT COURT limited E.
"August 1965. Catalogue Number 444. Woodcut in black, green, and brown, printed from three blocks. 430 x 320 (16 7/8 x 12 5/8"). There are copies with an incorrect year ('56 instead of '65). There exist proofs printed from two blocks, in black and brown, and from one block, in brown and green. 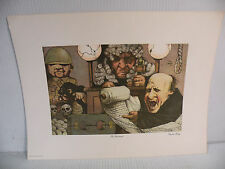 Art print Charles Bragg artistic Plate Signed Color Lithograph "The Indictment"
By William Papas. "Courtroom, Nashville". Equally as adept with a pen as he is with a paintbrush, Papas is able to capture the spirit of his subjects with a few well-placed lines. WILLIAM PAPAS. William Papas' art earned him his first prize at the age of seven. She studied at the Ecole D'Arts Appliques in Paris and worked as a designer and illustrator after finishing her studies. Since then, she has exhibited her works in prestigious galleries including Galerie Naifs et Primitifs in Paris and the International Arts Expositions in New York and Washington D.C. This is a limited edition hand signed lithograph by Nigel Hemming titled "Generations German Shepherds ". Nigel Hemming is undoubtedly one of the country's most successful animal artists. Nigel Hemming works have been published in limited edition form since the mid 1980's, enjoying increasing popularity with each new edition. Like Cezanne and Van Gogh, who also painted the countryside of Southern France, Zarou imbues his images with bright sunlight and the warm golden yellow and burnt orange colors of that lovely region. In 1975, he was invited to show at the Bibliothéque Nationale. 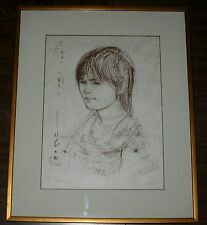 This is a limited edition hand signed lithograph portraiture by Robert Williomledon titled "The Teenager". Edition size: 450. This is a large hand signed lithograph by Lowell Nesbitt titled "Greg with Lillies ". Printed in 1979. But in 1989 Mr. Nesbitt publicly revoked the bequest after the Corcoran canceled a disputed exhibition of photographs by Robert Mapplethorpe, who was an old friend. Original Limited Edition Lithograph, 1979. Paper Size: 25" x 19.5.". Edition Size: 300, plus proofs. Signed & numbered in pencil. Certificate of Authenticity included. This is a Salvador Dali limited edition lithograph titled "Sirens and the Sailor". Prod uced on archival quality thick paper, pencil numbered from an edition of 500. Warhol’s pencil shading and use of vibrant colors allow the viewer to identify the eccentric nature of the cross-dresser. ANDY WARHOL. SCREENPRINT ON ARCHES PAPER. YEAR: 1975. SIGNATURE: HAND SIGNED AND NUMBERED ON VERSO BY THE ARTIST. This is a Salvador Dali restrike etching titled "Portrait of Chagall" (1973). "Strangers In Taos". Limited Edition Serigraph. by Louis De Mayo. He had his first exhibition in 1952. DeMayo made a segue to abstract art around 2002 and in 2011, DeMayo was awarded the prestigious Pollack-Krasner Foundation Grant. It is as painstakingly close to the priceless originals as possible. The original is on display within the Casa Buonarroti Museum in Florence, Italy. This lithograph was reproduced in a very sophisticated process by a well-respected and renowned lithographer, Mr. Amilcare Pizzi. He was the son-in-law of Diego Rivera. Published in 1978, this is Portfolio subject #11 from a 20 piece portfolio collection. Total edition size was 2000 pieces. This lithograph is signed in the plate. This is a limited edition original hand signed etching by George Crionas titled "HELLO THERE". By age 13, George's work was being published in the Detroit News, prompting one writer to note that" Little George Crionas is an extraordinary talent, with nothing but a bright future ahead. Elke started to paint in earnest using anything at hand for a canvas. Beautiful art piece on extra thick paper with gorgeous colors. This piece is numbered from an edition of 350. R.C.Gorman El-Bah Original Lithograph 1981 Hand Signed Fine Art Artist Proof. On canvas and glass framed. Will be shipped framed. Great condition. Feel free to contact me if there are any questions. Thank you for viewing this listing. This is a limited edition hand signed serigraph titled "TwoGirls at the Piano" by Geham Cohee. Born in Syracuse, New York on May 8, 1948, Gehan Cohee studied at the Art Students League in New York City. Artist Raymond Poulet was born in Paris in 1934 to a very poor family. He also attended courses at various painting and sculpture academies in Paris. He held his first group exhibit in 1960, which was followed by personal exhibits in France and in the US. 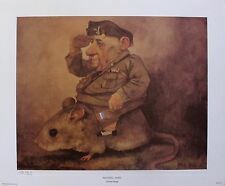 Louis De Mayo "Revolutionary Figure" Signed Ltd Ed Serigraph Artwork Make Offer! Limited Edition Serigraph on Paper. by Louis De Mayo. He had his first exhibition in 1952. DeMayo made a segue to abstract art around 2002 and in 2011, DeMayo was awarded the prestigious Pollack-Krasner Foundation Grant. Since age thirteen, Azoulay's thirst for adventure has taken him to many parts of the world, earning his way by painting and performing as an actor. His latest series of etchings capture the spirit and vitality of racing's most important competitions: Kentucky Derby, Preakness, and the Belmont. It was a year of study in France that culminated in a one-man show at the La Gravure Gallery, Paris. almost dance and sing. for the 2nd Rodin Grand Prize Exhibition. The popularity of his classes led to the creation, in 1950, of the first ever university-affiliated course in serigraphy. This is a limited edition hand signed lithograph by Nigel Hemming titled "Friends for Life ". Nigel Hemming is undoubtedly one of the country's most successful animal artists. Nigel Hemming works have been published in limited edition form since the mid 1980's, enjoying increasing popularity with each new edition. 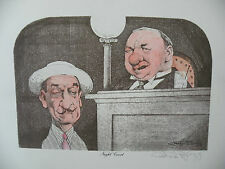 Art print Charles Bragg artistic Signed Color Lithograph "TORT" limited E.
Limited Edition Serigraph on buff Arches paper. by Louis De Mayo. He had his first exhibition in 1952. DeMayo made a segue to abstract art around 2002 and in 2011, DeMayo was awarded the prestigious Pollack-Krasner Foundation Grant. "Sinistra" From les Cariatides Suite. His latest series of etchings capture the spirit and vitality of racing's most important competitions: Kentucky Derby, Preakness, and the Belmont. Union Art Gallery, San Francisco, California 1979. 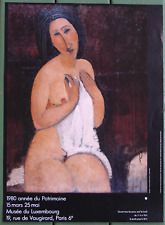 This is a limited edition original hand signed etching by George Crionas titled "HOMAGE TO MODIGLIANI". By age 13, George's work was being published in the Detroit News, prompting one writer to note that" Little George Crionas is an extraordinary talent, with nothing but a bright future ahead. Lester Hines "Chief Yellow Hair" Signed & Numbered Linocut Fine Art Print, OBO! Limited Edition Linocut (carving done in Linoleum) Print by Lester Hines. by Lester Hines. "Chief Yellow Hair". 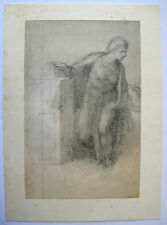 Pencil signed, titled, dated & numbered by the artist. Condition : Excellent. Certificate of Authenticity is included.